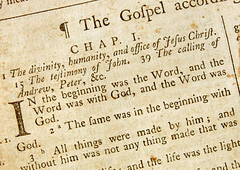 Why isn’t the Bible known as a historical textbook? “If you read a book that tries to change you for the better and it fails or doesn’t resonate, then it’s a self-help book. What I immediately thought as I read this, the Bible is revered by those who love it, or derided by those who hate it. There aren’t many in the middle who advocate the Bible for it’s historical insight. There are few who advocate it as a helpful book and many who condescend to say Jesus was a good guy who taught some good stuff, but in saying that, they expose themselves as never having grasped what the Bible is all about. Fundamentally the Gospel’s demands must make Jesus mad, a liar, or Lord over all! a liar if this was false and he knew it. a lunatic if this was false and he didn’t know it. a Lord, if this is true. Those who’ve actually read it, have Jesus as their Lord, or despise it for the implications of what it contains. Some (because there’s rarely only two options), are apathetic. That’s why it’s not seen as a history textbook by most. Next Article You always complain about the red lights, but you never celebrate the green ones. The Bible claims to be the Word, i.e. the Word of God the creator of the universe. However, it was written down by people who were inspired by God, shown exactly what to write, therefore – they cannot make mistakes.